Endemic to Central America, L. rubescens is found in dry areas exposed on tree trunks where they receive strong full sun but are cooled with plenty of air movement ! 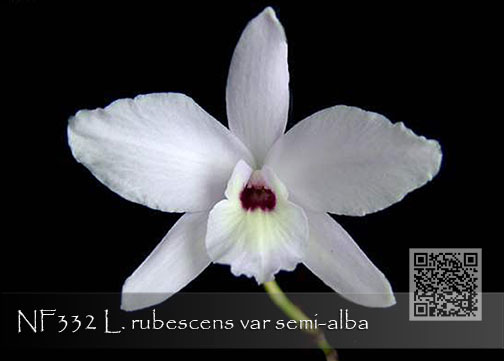 This stunning semi-alba form is pristine white with the bold accent of rich burgundy in its throat. 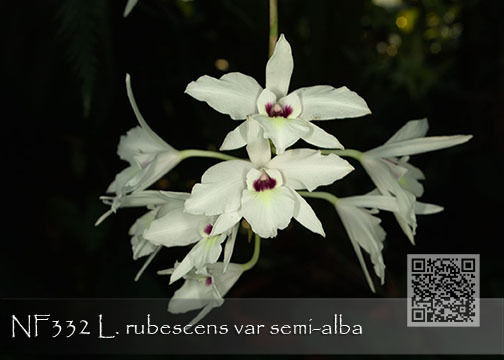 Its gracefully tall inflorescences are produced on newly mature pseudobulbs and can reach up to 3' long with their cluster of flowers produced at the apex. Give bright light and ample water during its growth cycle followed by a drier winter rest after flowering. Resume normal watering and fertilizing at the onset of new growth. Highly Recommended !